These tropical storms are only going to get stronger and more frequent. It might be time for the US military to reconsider the financial viability of building non-hardened facilities in the region. Eglin AFB, Tyndall AFB, Hurlburt field, Pensacola NAS. Then there are other Florida facilities like Patrick AFB, Macdill AFB that are also right on the water. Since the cold war ended a lot of realignment of military bases have favored the South, particularly the Southeast because of the low cost of living and political support. They should really try to prevent any more movement towards the region for just this reason. This will take years to recover. I spent a short time at Keesler AFB in 2007, about a year after Hurricane Katrina came through. They were still repairing and rebuilding after a year, with some buildings exhibiting constant water intrusion, collapsing ceilings, etc. The community around Keesler was still devastated, although the casinos had been rebuilt already. The Air Force could avoid these types of issues if they would just nuke the hurricanes before they reached shore. Nuclear fallout is a small price to pay to protect our country's shores. Rumors going around about damage to F-22s. Any word on that? Airforce times indicate 4 F22's damaged that were unflyable. Glad everyone is ok. Let's pick up the pieces, get the base back operational and begin repairing any F-22s. Lord knows we only have 180+. Does the DoD even keep the base open, based on however much it will cost to rebuild? My first duty station as a brand new 2nd Lt many years ago but have not been there in well over 15 years. A friend still stationed there tells me the rumour he is hearing is that two are completely gone based on damages, but big grain of salt with that right now. The news for Tyndall is going from bad to worse... Looks like more than two F-22s have been damaged and amazingly twelve were left at the base to weather the storm. Numerous QF-16s have likely been damaged or potentially written off and there might be other additional aircraft that have to be repaired. The Category 4 storm, the strongest to ever hit the Florida Panhandle, tore roofing from aircraft hangars and mangled buildings at Tyndall, located just outside Panama City, Fla., according to Air Force officials who reported “widespread catastrophic damage” primarily from winds that exceeded 150 mph. Hurricane Michael, downgraded to a tropical storm Thursday as it raced into the Carolinas, was blamed for at least two deaths after it left a trail of devastation across north Florida and Georgia. Other military installations in its path seemed to have been spared major devastation, according to several defense officials. An aerial assessment revealed that “all base houses sustained significant roof and siding damage. Some houses sustained more significant structural failures” and some dorms were severely damaged,” according to a separate Tyndall Facebook post. Other areas that sustained “severe” or “catastrophic” damage include Tyndall Elementary School; the BX and commissary; the two shoppettes; the drone runway; and the Tyndall marina, which was “completely destroyed,” missing all structures and docks. As of Thursday, no injuries were reported on the base, which was under a mandatory evacuation order since Tuesday. All of the operational aircraft assigned to Tyndall were evacuated ahead of the storm to Wright-Patterson Air Force Base in Ohio, Carswell Field in Texas and Barksdale Air Force Base in Louisiana. Meanwhile, the Florida National Guard began moving into impacted areas for rescue and clearance operations. Florida Gov. Rick Scott activated 2,500 National Guard troops ahead of the storm. In Georgia, 1,500 National Guard troops were activated to aid in response efforts. Other military installations in the area were returning to normal operations or expecting to do so, while officials at bases in North Carolina continued to watch the storm’s path. 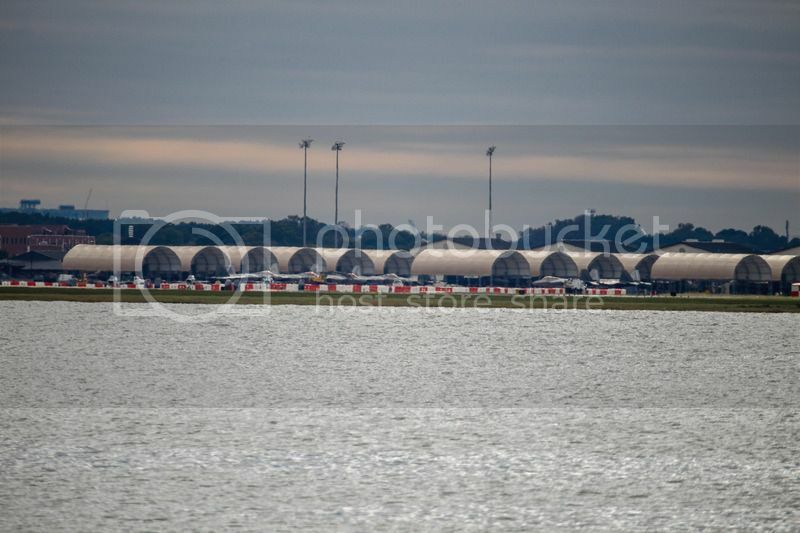 Tyndall F-22's arrived at Langley today. Not sure how many but the F-22s now at Langley didn't fly direct from Tyndall, these are the aircraft that evacuated before the hurricane. Obviously...was there any question about that???? Some images of an F-22 inside one of the Tyndall hangers has been posted online. It might be a trick of the image but it appears that the aircraft is not sitting correctly although it is hard to make out any specific damage to the airframe with the jet being covered in debris. The top picture was with a very wide angle lens, there is a lot of 'fish eye' in the hanger too. It would be hard to bend the landing gear without something crushing the top side of the wing. I will also note that the top picture is a different plane then in the other two. The tail number while unclear is different. Under close inspection, the lower two pictures are in a different hanger from the 1st, the hanger doors have windows not visible in the top photo. I am surprised that the roof in both of these hangers is less damaged than I expected. Seriously underestimates the energy involved with a hurricane while simultaneously overestimating the energy of a nuke or hydrogen bomb. That first picture, I think the F-22 is under the un-damaged (or at least lesser damaged) roof portion ... extreme left part of the image is where the roof was peeled off; you can see the gap in that 1st roof truss. Some F-22s have now left Tyndall with the damage not as bad as first thought. According to the article as many as 17 may have been left to ride out the storm. Tyndall Air Force Base was heavily damaged earlier this month after the Category 4 storm tore through the base. As Hurricane Michael approached the base, mission capable F-22s assigned to the 325th Fighter Wing were “Hurrevaced” to Wright-Patterson AFB (and later relocated to Joint Base Langley-Eustis). According the data emerged thus far, at that time 31 percent of 55 Raptors assigned to the unit were NMC (non-mission capable) and could not be moved away. So they were sheltered in place and consequently damaged: photos of F-22s and QF-16s in Tyndall’s shredded hangars have already made the news after they started circulating social media. After the first assessment the Air Force’s top leaders said the F-22s that had remained in Tyndall when Hurricane Michael struck were not as badly damaged as originally feared. According to the first reports, as many as 17 aircraft were possibly damaged by Michael. The Air Force has not disclosed yet how many Raptors were exactly damaged and the extent of such damages but the more recent figures point to 10 to 14 Raptors. “Some F-22s that sustained minor damages will be moved to Langley Air Force Base, Virginia, early next week to join F-22s that were previously moved there,” Military.com’s Oriana Pawlyk reported today. However, photographs released by the DoD in the last few hours show Raptors being flown out of Tyndall by pilots from the 27th Fighter Wing, Joint Base Langly-Eustis, Virginia, on Oct. 21 and 22. The west ramp at Langley is now full of Raptor's. Yes, but not just for ground instruction. These are training aircraft that do not even have the latest mod's that front line F-22's have. Why do you need exotic radar absorbing paints for training flights? You only need the airframe to fly and handle correctly, you do not need stealth and the associated cost to maintain it on training flights. First they say they only left unflyable aircraft there. Then plenty are able to fly out after the storm. The storm was two weeks ago. In that time, I'm sure they were able to get some aircraft prepped for flight which they weren't able to do in the hours before the hurricane hit. The other thing you need are pilots certified to fly them. And its not like they'll fly back in as the storm is approaching. Or, is it more probable that they may have gotten permission to fly out jets with minor issues for the flight to Langley? That could have been a very, very, very expensive loss.